New Orleans Mayor On Katrina Anniversary: 'We Saved Each Other' : The Two-Way The 10th anniversary of the devastating storm was marked by prayers and church bells to remember the estimated 1,800 who lost their lives in the disaster. 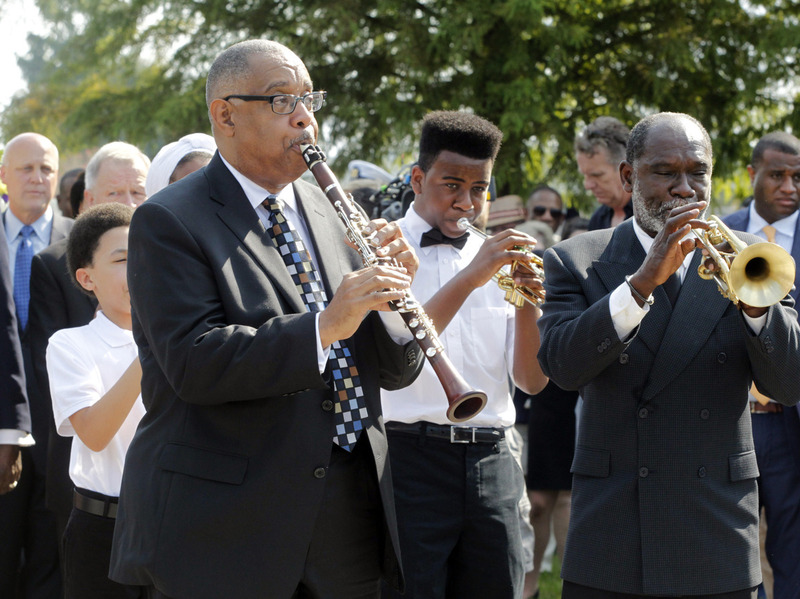 Musicians lead the procession during a wreath-laying ceremony at the Hurricane Katrina Memorial site in New Orleans on Saturday. Prayers and church bells in New Orleans marked the 10th anniversary of Hurricane Katrina, one of the deadliest natural disasters in U.S. history. Mayor Mitch Landrieu, speaking to assembled dignitaries at a memorial to the unclaimed and unidentified among the estimated 1,800 who died in the storm, said the city had to rely on itself to get through the tragedy. "We saved each other," Landrieu said. "New Orleans will be unbowed and unbroken." "Ten years. A decade of gutting houses, repairing roofs, fighting mold, reopening businesses, reimagining schools, winning a Super Bowl, feeding our bodies, feeding our souls, dancing, crying, holding on, letting go, feeling stuck, moving forward. "As towns and cities along the Gulf Coast commemorated the anniversary of the storm's landfall this week, many recalled the chaotic recovery efforts while others saluted the cleanup that has allowed some places to adapt and flourish. "Although some will celebrate the resiliency and recovery of the Gulf region, many continue to feel the painful consequences of Katrina a decade later," said Gulf South Rising, a coalition of frontline Gulf Coast communities." The Associated Press says former President Bill Clinton will headline a free concert-prayer service tonight at the city's Smoothie King Center. On Thursday, President Obama spoke in the city, calling Katrina a "man-made" disaster caused by government failure. "New Orleans had long been plagued by structural inequality that left too many people, especially poor people, especially people of color, without good jobs or affordable health care or decent housing," Obama said. "Too many kids grew up surrounded by violent crime, cycling through substandard schools where few had a shot to break out of poverty." And, on Friday, former President George W. Bush, whose administration bore the brunt of criticism for the slow response to the storm, said he will never forget the images of "misery and ruin" in the city where "the levies gave out but ... [the] people never gave up."